STAIR raised funds to provide free volunteer reading tutors. 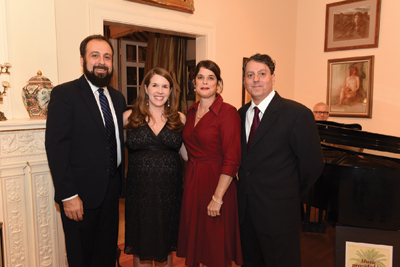 Start the Adventure in Reading (STAIR) celebrated 31 years of service and the achievements of its students with a party attended by more than 150 long-time supporters, tutors and volunteers at the Audubon Boulevard home of Kerry and Chris Bruno. Robert Louis Stevenson’s classic children’s novel Treasure Island was the theme of the evening. Pianist Jimmy Maxwell entertained the indoor crowd while Asher Ross delighted partygoers on the steel drums outside. Food donors included: Broussard’s Restaurant & Courtyard, The Rum House, Ironsides Food Truck By Sodexo, Midway Pizza, Carol Lacey, Baker Maid Cookies, French Truck Coffee, Mint, Nirvana and Ye Old College Inn/Rock ‘n’ Bowl. Beverages were donated by Barefoot Wine & Bubbly, E. & J. Gallo Winery, William Grant & Sons Distilling Ltd., Republic National Distributing Co. and Southern Eagle. Flowers were from NOLA Flora with photos by Jim Howell Photography. An array of unique silent auction items were provided by many long-time donors including: The Roosevelt Hotel, Bourbon Orleans, The Hyatt, Mignon Faget, Peyton Manning, Karla Katz Antiques, NOLA Couture, Fore!Kids Foundation, Dickie Brennan and Company and many more. Wellington & Co. Fine Jewelry donated a gorgeous black baroque freshwater pearl bracelet plus a $250 shopping spree. A food truck party for 50 was donated by the famous Ironsides Food truck. Vonn Bell, safety for the New Orleans Saints, who has adopted STAIR as his local charity, graciously donated an autographed #48 jersey, along with two autographed footballs signed by the entire 2016 team. STAIR strives to improve literacy rates for New Orleans elementary students who are at risk of falling behind.